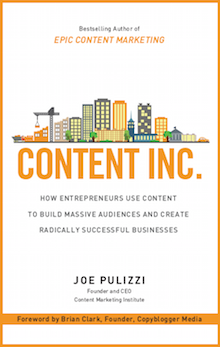 When the Content Marketing Institute asked me to review an early copy of Content Inc.: How Entrepreneurs Use Content to Build Massive Audiences and Create Radically Successful Businesses, I jumped at the chance. I knew it would be useful for my work helping businesses create content marketing strategies. What I didn’t expect is how much it would help me with my own marketing.